Construction and Destruction are still fragile masters of a bewildering power, conjuring the witchy side of Black Sabbath and the spooky heft of Elevator with arty dynamics. 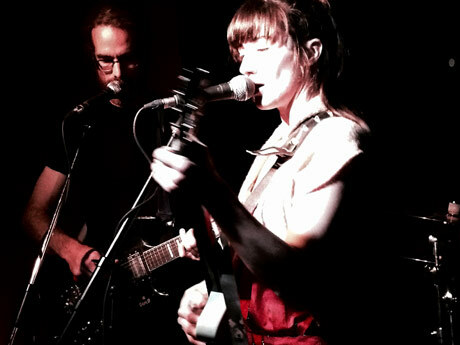 Colleen and Dave often alternate between gritty guitars and rough, primal drumming and emotive singing. Their harmonies are spine-tingling, and certain songs lead to a total blood rush. Dave is often the calm centre of C&D, nonchalantly playing all of his instruments consistently, digging into a vocal or guitar jam when the song called for it. Colleen's stage presence was more temperamental; she was cheery between songs but seemed to be spiritually inhabited while performing. Possessed is the wrong word but she draws from some deep reserve of feeling when she's singing or playing drums with fervent determination. Sometimes, the pair seem to be taunting a catastrophe but always escape scrappily, unscathed. Their hallmarks were on full display here; Construction and Destruction are a mighty band from Canada unlike any other.